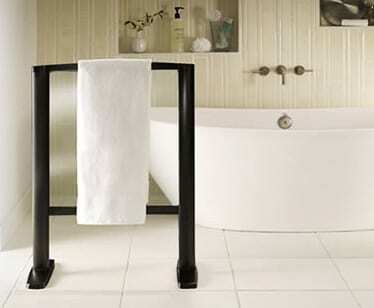 Having a towel warmer can go a long way towards making the bathing experience more pleasurable. How many times do you dread leaving the comfort of a shower or bathtub on a bitter cold day? If you are like me, this is not something that you look forward to. Having a heated towel can maintain the “warm chain” as you exit the shower or bathtub and set foot into the bathroom. This product by Thermique is a free standing unit that requires a standard plug outlet for electrical power. There is a pane of glass that the towel drapes over that conducts heat to keep the towel warm. Thermique offers 8 combinations of finishes and colors to help match it to your bathroom’s colors. There is also a wall mounted example that I included in this article. I like the fact that the towel warmer is “free standing” and therefore can be stored away during warmer months creating more space in the bathroom.